I recall one of the early visits to the cancer treatment center when my late wife, Carrie, was receiving a typical six to seven hour chemotherapy treatment. The oncology social worker, Kathleen, stopped by to talk. Kathleen encouraged me to stay involved with my wife during the cancer battle. I thought it an odd encouragement. I was involved already. I was committed to being at every doctor visit, treatment, and procedure. Over the next few months Kathleen and I had several conversations about an all too often “absent husband syndrome” during a wife’s illness. According to Kathleen far too many husbands check out during a wife’s battle. In extreme cases some leave their wife by divorce. Other’s become overly busy in work and “can’t” make it to doctor appointments, treatments, or other events. The first time I heard about this syndrome I was a little dismayed; the idea of not being with Carrie seemed so foreign to me. I can only postulate the why’s behind this behavior. Perhaps some are avoiding their own pain or maybe others are in denial as to the seriousness of the situation. In some situations it may not be possible for a spouse attend something but I am convinced those are very, very rare. Personally I knew I had to lean into the pain and be actively present in everything that Carrie was experiencing. I recognized that this cancer was life for us so I couldn’t treat it as an interruption. I realized that if Carrie survived this cancer my presence would make our relationship stronger and more intimate. If she didn’t survive, I would have no regrets concerning how I wish I would have supported her. And since the latter is what happened, I can with all confidence say I demonstrated my love and devotion to her until the end. With Kathleen’s encouragement I wrote a one page (front and back) handout from my personal perspective to hopefully encourage all caregivers but especially husbands to be more involved with their wives. A link to the PDF version is at the top of this post. If after reading it you feel that it might be useful, please feel free to forward it to a local cancer care center. Some roles in a man’s life are chosen: becoming a father, husband, or an employee; while other roles such as a son or brother are unchosen. Still others come about by circumstances of life. 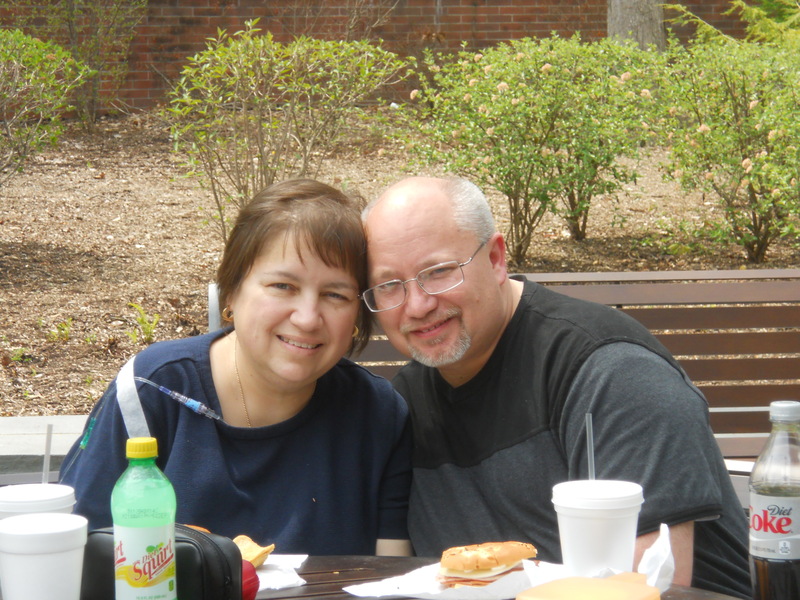 In December 2010 my wife was diagnosed with pancreatic cancer and circumstance added a new role to my life—caregiver. My wife’s current treatment finds us staying near the treatment facility during the week and traveling home on the weekends. During a recent trip home I rented the movie Captain America: The First Avenger. As the movie begins the main character is a scrawny, asthmatic young man who desperately wants to join the military to serve his country during World War II. Time after time he tries to enlist only to be rejected because of his size and medical condition. Eventually he’s accepted, gets injected with a special serum, and becomes a superhero. The character’s willingness to step up and meet the challenge brought about by the circumstances of World War II stood out to me. I recognize some application of this character’s determination in the present circumstances of my life. My circumstances recently brought me into a small group meeting of mostly men who were all caregivers to spouses with cancer. During the meeting I was asked about my biggest fear with my wife’s diagnosis. After a moment of thought I replied that it was that this struggle would somehow reveal a deficit in my character. A fear that in some way I would not step up and fulfill my role, to fail to be the man my wife needs me to be. While considering this fear and the difficult role of being a caregiver, I realized that there are several paths which one might follow. One possibility is to withdraw from the role. There is a natural response of fight or flight anytime one feels threatened. The diagnosis of a wife’s cancer is a threat of great pain. Thus, a natural reaction may be to flee the pain. Withdrawing takes many forms from absolute abandonment to burying oneself in work or activity. However, withdrawing only brings a promise of regret with no reduction in the pain. The opposite of flight is to fight. On one hand it seems that in the face of a serious illness there is some benefit with fighting. To fight the disease, fight for the best care, and fight for the best outcome are admirable pursuits. On the other hand, fighting may turn into another type of withdrawal where the busyness of fighting separates one from relational intimacy and emotional engagement. Another response may be to stoically go through the motions of fulfilling one’s duties and responsibilities. Undoubtedly there will be situations that arise which will call upon one to set aside emotional involvement to address the needs. I am also confident that this type of emotion-less long term response betrays our God given humanness and does not offer the support one should provide as a caregiver. The last response—and the one I believe to be the most appropriate—is to go all in. Going all in is about engaging the emotional pain, the fatigue, the emotional rollercoaster, the ambiguity, and the finiteness of this earthly existence with one’s whole being. Going all in implies wrestling with all the hard questions, facing the uncertain answers, and being fully present with the one receiving care. Going all in is about serving, nurturing, encouraging, and comforting. Going all in is stepping up. The Captain America character tried over and over again to answer the call until he succeeded. As caregivers, I feel that we should do no less. A caregiver must choose to meet the challenge no matter how many attempts it takes. My personal choice is to fight the natural tendency to withdraw and to avoid stoic responses as much as possible throughout our battle with cancer. My journey as a caregiver includes being at my wife’s side during her appointments, treatments, tests, and procedures. My choice is to talk with and listen to her about life’s hopes, fears, joys, and frustrations. I also choose to face not only her mortality but mine as well. My choices call for priorities which will take time away from other activities so that I might fulfill my role. These priorities also include taking care of myself with proper diet, exercise, and appropriate respites. In the end, circumstances may have brought about the new role as caregiver. Unlike Captain America there is no serum which will make a caregiver superhuman. However, one’s willingness to go all in will make every caregiver a superhero.